There are nearly 4 million potential voters in Puerto Rico, but they are not able to vote for the president, for senators, or for voting congressional representatives. This arguably makes their opinions less relevant to decision makers in Washington and state capitols. However, there are also now more than 4 million potential voters of Puerto Rican heritage on the mainland whose votes can make more of an impact. Puerto Rican voters in the states are included in a new interactive map of Latino voters in the U.S. prepared by Pew Research. The map shows concentrations of Hispanic voters across the nation, as displayed in the screenshot above. The highest concentrations of Latino voters are in the Southwest and in pockets of Florida, although Hispanic populations can be found throughout the country. According to Pew, more than two-thirds of Hispanic eligible voters live in six states: California, Texas, Florida, New York, Arizona and Illinois. Yet it is New Mexico that has the highest Latino eligible voter share (40.1%), followed by Texas (27.4%), California (26.9%), Arizona (20.3%) and Florida (17.1%), and the number of Hispanic eligible voters his growing fastest in states not typically recognized for their Hispanic populations: South Carolina (up 126.2% since 2006), Tennessee (up 113.7%) and Alabama (up 110.5%). 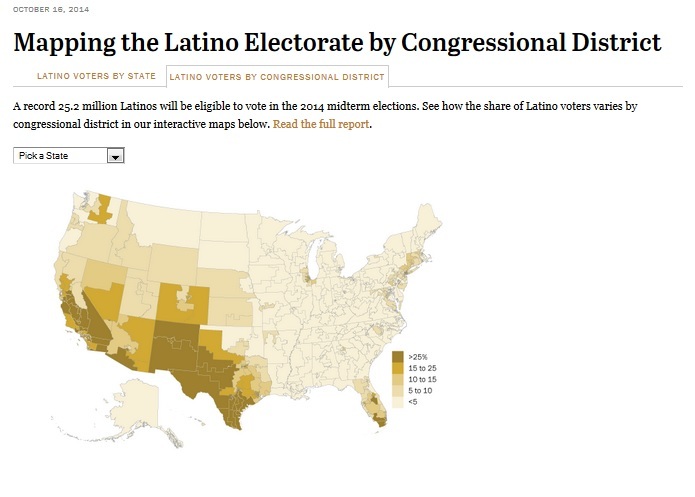 Pew concludes that Latino voters, though they make up more than 10% of eligible voters, may not be as influential as those numbers suggest nationwide in the 2014 midterm elections. First, Hispanic turn out for midterm elections is historically low. Second, the proportions of Hispanic voters in most of the states in which there are highly competitive Senate and gubernatorial races are relatively low. Pew further explains that in the eight states with close Senate races, just 4.7% of eligible voters on average are Latinos. Only in Colorado does the percentage of Latino eligible voters (14.2%) exceed the national average (10.7%). As a result, the impact of Latino voters in determining which party controls the U.S. Senate may not be as large as might be expected given the group’s growing presence nationwide. The influence of this emerging demographic may be more likely to be felt in 2016. Yet the Hispanic electorate may have influence in choosing the next governor of Florida, where former Gov. Charlie Crist (D) is narrowly ahead of current Gov. Rick Scott (R). The Hispanic population in Florida (4.5 million) is the third largest in the United States. Puerto Ricans comprise roughly 20% of the state’s Hispanic population (900,000). According to Pew, 1,706,000 Latinos were registered to vote in Florida as of July 28, 2014, representing 14.4% of the state’s registered voters. Among all Latino registered voters, 467,000 are registered as Republicans (11.3% of all Republican registered voters), and 653,000 Latino registered voters are registered as Democrats (14.2% of all Democratic registered voters). As recently as 2006, the registration rate for Hispanics in Florida was higher among Republicans (37%) than Democrats (33%). By 2008, the number of Democratic registrations in the Hispanic community overtook the number of Republican registrations. Today, the gap between Hispanics who are registered as Democrats (38%) and those registered as Republicans (27%) is at its widest point. In a recent poll of Puerto Rican voters living in Central Florida, 92% of respondents were registered to vote in the state: 55% as Democrats, 19% as Republicans and 17% as Independents. Yet on political issues, 48% of respondents consider themselves conservative, 29% consider themselves moderate and 17% consider themselves liberal. Respondents were solidly conservative when responding to questions on social issues such as school prayer and abortion. In addition, while President Obama was popular in the poll, so was former Governor Jeb Bush, a Republican. Former Governor Bush, who is sometimes discussed as a possible 2016 presidential candidate, was almost as well known as Obama despite having left the governorship in 2007 and many residents of Florida of Puerto Rican origin being relatively new to the State. Only seven percent of those polled were unaware of him. Forty-six percent had a positive opinion of the former governor, substantially more than the 29 percent who had a negative impression. With respect to the current election, the recent poll found that twenty-eight percent of respondents had an favorable impression of Gov. Scott versus 37% who had a unfavorable one. Nineteen percent had no view of Scott and 13% said that they did not know of him. Scott’s Republican predecessor and now Democratic challenger for re-election, Charlie Crist, was more significantly popular. He was viewed positively by 41% of those polled and negatively by only 27%. Seventeen percent were unaware of him. Twelve percent did not recognize his name. Read the full Pew report.